A campus organization called Your Turn, Stout raised awareness of a recent hate/bias incident on campus by plastering posters across campus that read, “A student reported hearing three to four loud males on campus using threatening language toward the black community.” These posters were found around campus and on their social media platforms. 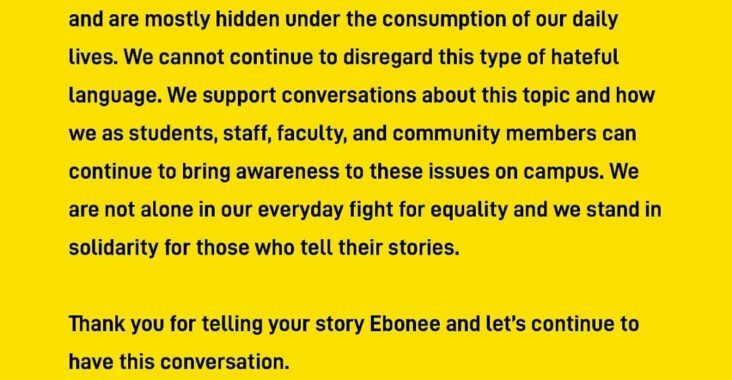 Ebonee Rainwater, a senior studying entertainment design with a concentration in animation, as well as a Residential Advisor in Antrim-Froggat (AF), is the student who was involved, heard and reported this hate/bias incident. Rainwater was sitting in her room when she had the misfortune of hearing the language being used by these men around 10:30 p.m. They were found walking south in between AFM and the Memorial Student Center. “Initially, I wanted to make sure I heard them right because I’ve never really experienced that so personally and so close to home. I think what made me upset and made me know I had to report it was the fact that they were just open and very comfortable saying that,” said Rainwater. She continued to say she never thought Stout was a campus where people—student, faculty, and/or staff—felt comfortable using and saying the kind of language that these men were using. Rainwater, along with many other students of marginalized communities, felt uncomfortable after the incident happened. “I always watch myself, like when I’m walking back from my late studio hours, but since that’s happened it’s been in a different way. I’ve been making sure I have my hood on, so they don’t see who I am and my skin color and things like that… I never considered that before. It never came across my mind before. I’m not going into extreme lengths to hide it, but just knowing that that can be a factor at any given moment is a little bit more nerve-wracking than usual,” said Rainwater. Before reporting the incident, Rainwater debated over whether or not to do so. In her report, she tried to be as specific as possible being that the language wasn’t directed toward her personally. “I was really mad when I heard that, I was kind of fuming, and I knew that if I didn’t say anything it’s going to ruin my night and it’s going to ruin a lot more of my day if I don’t say anything,” said Rainwater. After she reported the incident, Rainwater took the liberty and posted her experience on Facebook for herself and others on campus, including Your Turn, Stout. Rainwater was glad to see the amount of attention that her post got, in a positive way of course. On 18 Mar, Your Turn, Stout held an open discussion event in the McCalmont Basement regarding this hate/bias incident. The conversation had various questions that revolved around reflection of the incident and everyone’s thoughts about free speech. “Conversation is the most important part in allowing everyone to heal, learn and be vulnerable. We can’t learn if we don’t talk to each other. You don’t learn things just by going to class. You need to engage in dialogue and interact with real people,” said Chia Lor, a student leader in Your Turn, Stout. She wasn’t surprised that the incident happened, but was still upset that it happened. The conversation gave students, faculty, staff and community members a different perspective of different communities on campus. Not only that but this conversation opened up on how we are able to communicate hard topics, like the incident, across campus and use it to educate those who are unaware. “I think that self-accountability is so important. I think that it is necessary for people to educate themselves and take the initiative to start conversations that may make people uncomfortable. I think our campus can take initiative by being transparent and holding more of these open discussions,” said Lor. “The campus community at UW-Stout is committed to ensuring an inclusive and welcoming environment for students, staff and faculty, and strives to provide an accepting place for all to work and learn. We are a university that welcomes all ideas and a place where people can be themselves. The students and staff at UW-Stout appreciate the diversity of humanity and reject prejudice and discrimination. To report a hate/bias incident that happened to you or someone else, go onto the campus Dean of Students section of the campus website: (https://www.uwstout.edu/life-stout/student-services/dean-students) and scroll down the page to find a button to report the incident.